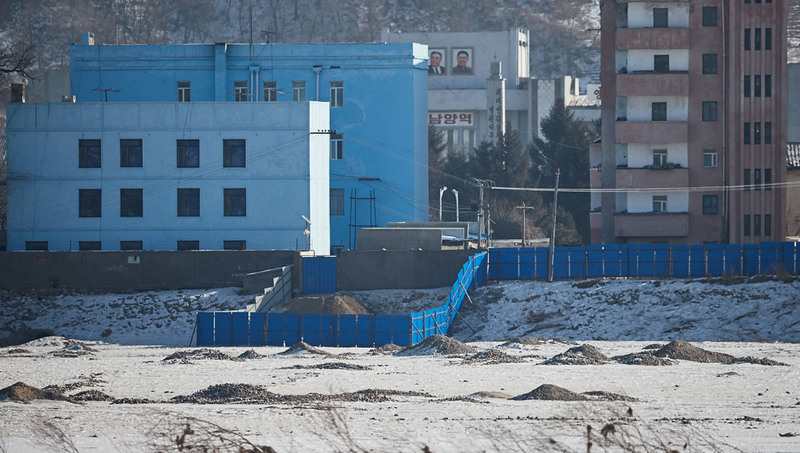 Construction progress at a new bridge being raised across the Tumen River, which separates the North Korean town of Namyang with the Chinese town of Tumen, appears to have stalled, photos recently taken at the border and satellite imagery shows. Multiple photos taken on January 24 show a structure capable of carrying single-lane traffic crossing approximately just one-third of the river basin, with access roads on both sides of the bridge far from completion. Construction of the bridge, which is being built adjacent to the original but now damaged 1941-era crossing, had been previously suspended “due to snowfall and cold temperatures,” the Seoul-based Daily NK reported in January. But while the outlet said construction would “restart soon after Lunar New Year’s (January 28),” satellite images of the area since taken with at least weekly frequency show construction to have remained stalled, with the length of the partial crossing remaining unchanged since January 24 ground-level photos were taken. Google Earth imagery shows the point the bridge abruptly stops at is the part of the river where the North Korean frontier begins, suggesting the delay is likely due to the DPRK side. Notably, the area was damaged severely in late-August 2016, a natural disaster which led to North Korean authorities rapidly constructing a number of new lodgings on the Namyang side of the border, some of which can be seen with orange roofs in the bottom of the above satellite imagery. 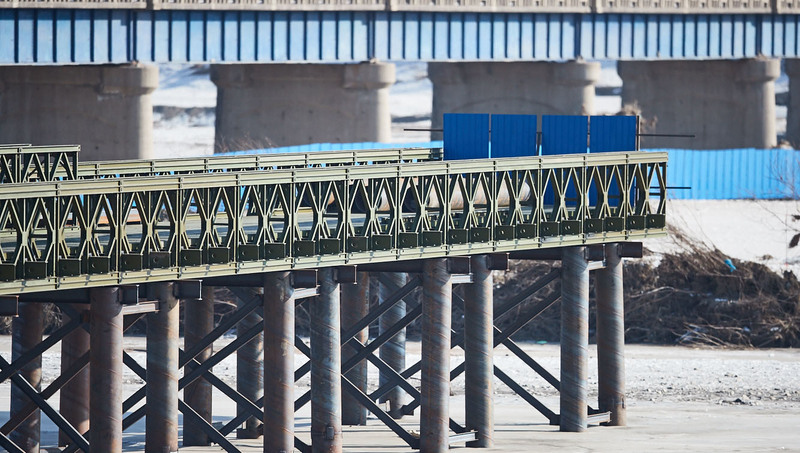 A far larger bridge constructed by China at a cost of $350m, which extends between Dandong and an area near Sinuiju in North Korea, has also been stalled since 2014, lacking required infrastructure and connecting highways on the DPRK side of the Amnok (Yalu) river. North Korean state media announced that the bridge would be built in September 2015, though offered no expected date of completion. “An agreement on the joint construction, management and protection of the Namyang-Tumen new border bridge between the governments of the DPRK and China was signed,” the Rodong Sinmun said.